Headliners I HATE TODD. Pictured are Nelson Sobral on guitar, Troy Larabie on percussion, Kev Carney on bass and local musician Capucine Onn on violin. Since I have moved back to the county in March, I have been absolutely amazed at the talent that this area has to offer. I have always been a local music fan and enjoy checking out new artists so I was pretty excited to see I HATE TODD perform live at the Livery with special guests the Fermented Oranges. The fellas from Fermented Oranges (whom I have had the pleasure of working with before with Blyth 14/19’s HuronSound Festival) rocked the house with their original songs and never cease to amaze the crowds they play for. Their punchy rock/funk riffs were striking, and that carefree beachy vibe was captured especially as they jammed out barefoot and in board shorts. It’s never a let down to see these guys play. Cappy Onn’s violin school kicking off their set. 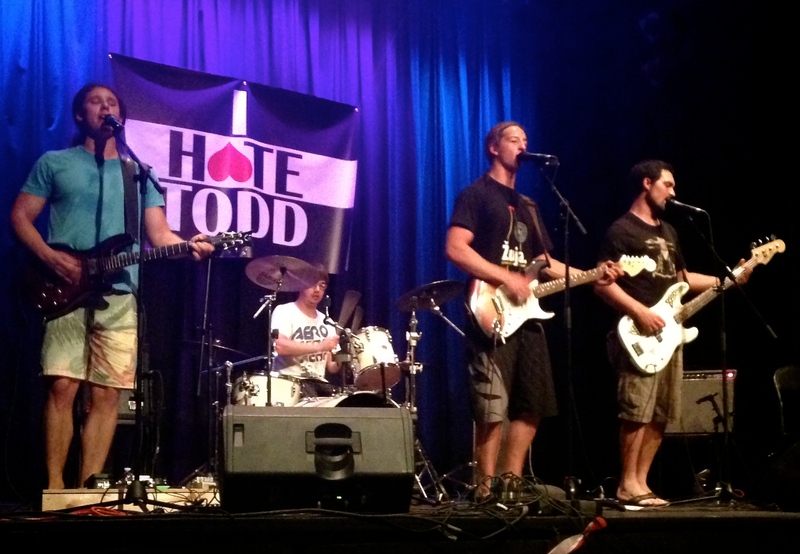 Next up was the headliner, I HATE TODD, the indie-alternative rock band out of Toronto. It intrigues me to see how a variety of instruments and musical styles can collaborate to make a unique sound-and they nailed it. Capucine Onn, local violin virtuoso had her Suzuki violin school start their performance with a beautiful symphonic rock piece and it was great to see kids of all ages showcase their talent. Then the party started as eccentric frontman Todd Preston came out with the rest of the band members to play their popular hit, “Zombie Love”. Their performance was theatrical and captivating to say the least, and their genuine good-time attitude was contagious. After watching their set, I came to the obvious conclusion that there are very few things cooler than a zombie-loving, violin-shredding, pop-rock band. It’s basically a scientific fact. Thank you Cappy for setting up this unforgettable show! The guys of Fermented Oranges. Aaron Voskamp on lead guitar, Dylan Bellinger on drums, Adam Wendler on lead vocals/guitar and Dean Reynolds on bass.